I love writing letters. One year, I made a New Year’s resolution that I would write one letter every day. My passion around corresponding with others was so strong, that was the only resolution I’ve ever kept. In 2 Corinthians 3:2-3, Paul wrote: You yourselves are our letter; written on our hearts, known and read by everybody…written not with ink, but with the Spirit of the living God; not on tablets of stone, but on tablets of human hearts. It thrills me to think of myself as a living letter. It gives me joy to know the Spirit of God writes on our human hearts. But being read by everyone? There is something a little chilling about that thought. Throughout our lives, God sends many love letters our way. If you are like me, there are some that brought great joy, but there are several I suspect you wanted to mark Return to Sender. The words seemed harsh and unsympathetic and I wondered if they were really from God. Would a loving God be telling me that? I knew, though, by the return address He had sent them to me. And deep in my heart, I suspected He sent them because I needed to grow. People have sent me letters I’ve kept for many years. They were so uplifting, encouraging and there was no way I could toss something so inspirational. I take them out and read them over and over again because they are such treasures. And when God sends me one of those, I’m filled with a holy joy, an almost unspeakable divine ecstasy. You are a letter to the world, just as I am one. God has written His message on our hearts and mailed us out to the world. People read His message in our actions. They become acquainted with His presence in our words. 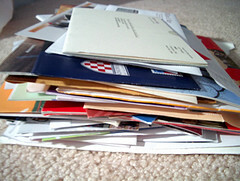 What do people read in your letters? Will they be welcomed like a soldier so happy to have a letter from home or will they be viewed as junk mail? Are they dreaded like an overdue bill or will people see your letter as one written with exquisite love – wooing them to Christ? This entry was posted in Joy and tagged contentment, friendships, God's love, Joy, life, relationships on May 21, 2015 by Myra Wells. 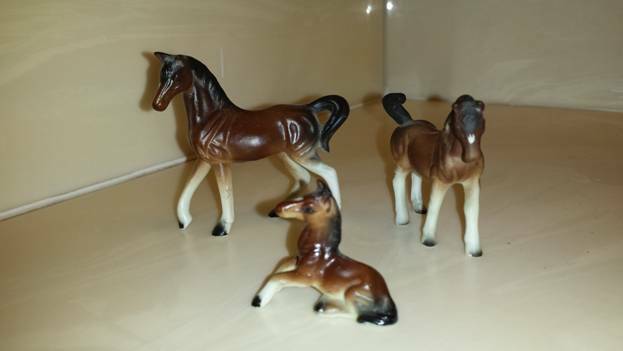 I was actually looking for something else, when I found them – three small china horses I’ve had since childhood. I first saw them at the card store I passed on my way to and from grammar school. I wanted them so badly and finally got them as a birthday present, maybe when I was around nine. Throughout my life, they have been carried from place to place, always given a place of honor. As I grow older, they are even more precious to me as a reminder of a happy childhood moment. Finding them was a blessing. Anytime I find something lost is imbued with the sacred. It is more than just a hard-worn celebration, more than knowing the frustrating search is over. Often, in that glorious moment of discovery, I remember the 15th Chapter of Luke, where Christ tells the parable of the lost sheep, the lost coin, the lost son. My heart leaps from the understanding that I serve the God who cares about lost things. He goes looking for the lost souls in the world, cherishing each and every life. Christ found me in the midst of a fearful and vulnerable time in my life and cradled me through it. He has been my strength ever since. As Christians, we are to walk by faith, standing firm in our beliefs, not needing signs from God. But I fall more deeply in love with God when He sends a reminder of who He really is. The good gifts He gives us nourish our hearts in ways we cannot imagine. Exposed in these beautiful, luminous signs is the awareness He will keep all the promises He gave us in His word. Finding a lost object is one way He showers encouragement. He is always faithful to send these little reminders of His love. They come in many ways – through His word, through faithful friends who pray for me, through the love of my husband, in answered prayer. They all remind me that He understands my frustrations; that He cares about my pain, that He celebrates my joy. He is with me and He is for me. He will always find a way to tell me how much He loves me. He will do the same for you. It might not be by finding a lost object. For you it might be in the hug of a friend, in an unexpected surprise, in a walk through a garden awash in color. God is crazy about you and He’ll keep presenting you with the gifts of His love. That’s why finding something that was missing is a personal, sacred reminder God is God. He is leading my life. He shouts to me that He will never leave me or forsake me. And that He sends reminders of this promise throughout my day, if I just take the time to notice. How is God reminding you of His love today? This entry was posted in Improving Every Day Living, Joy and tagged contentment, encouragement, God's love, grace, Joy, Rescue on May 2, 2015 by Myra Wells.